After a forgettable offseason, lacrosse starts year one of their program rebuild. Not many teams have to rebuild after an NCAA tournament trip, but not many teams lose 12 players and their coach during the offseason. U of L hired coach Scott Teeter away from Canisius in November. He said the call to come to Louisville was overwhelming due to the timing, but a lifetime opportunity. Teeter inherited a 19-player roster made up of 10 freshmen, seven seniors and two graduate transfers. Six weeks on the job, Teeter added five players — three transfers, one freshman and a returning Madison Hoover. For Teeter, pitching Louisville to transfers wasn’t hard. “Louisville sells itself. Once players get here and they see the resources, playing in the ACC and the direction of our coaching philosophy, it’s an easy sell,” Teeter said. Teeter added his pitch to the three transfers included being part of the future. The now 24-player roster has eight seniors. The 2018 group is highlighted by Hoover, Jillian Balog, Emily Howell and Taylor Webster. Hoover announced last fall her attention to leave the program under the previous coach Kellie Young. Now that Teeter is at the helm, the Cardinals return their assist leader (19) from 2017. Webster, a defender with 47 career game appearances and 29 starts, tore her ACL prior to the season, leaving a huge hole in the Cardinal defense. Howell, a defender who has started in all 55 career games, expects Webster to still make an impact despite not being able to hit the field. Balog scored 16 goals in her 19 games last season. Recording 15 starts, she adds experience as a midfielder. Freshmen to look out for are midfielders Maddie Birch, Cassie New and Caroline Blalock and attackers Shayla Scanlan and Lexi Arens. Having a team full of freshmen and seniors is difficult, but Teeter sees the benefits. “It’s good because you play one off the other. You expect the seniors to take the freshmen under their wings. Then you expect the freshmen to push the seniors to new levels,” Teeter said. Two of the three transfers Teeter brought followed him from Canisius. Juniors Brenna Shannon and Tessa Chad were All-MAAC First Team members last season. Shannon, a defender, has 62 ground balls through two seasons, along with 34 draw controls and 44 forced turnovers. Chad has 91 career goals (53 as a sophomore) and 144 points. Her 102 points last season ranked sixth in the MAAC. Furman grad transfers Hope Herline (defender) and Molly Marshall (attacker) joined in the fall and will be immediate players for U of L.
Courtney Deena, a midfield grad transfer, played field hockey for four years at Maryland. Teeter said her determination and ability to play two Division I sports is remarkable. Louisville starts their season on the road against Cincinnati on Feb. 9. The Cards have never lost to Bearcats, but CU has closed the gap in the past three years. 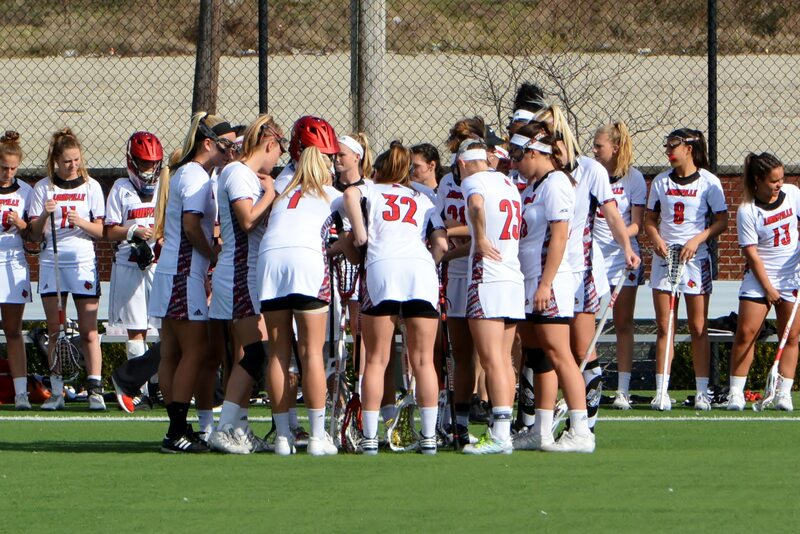 U of L then hosts Marquette and Denver, both one-goal games in 2017. Playing in the ACC, Louisville plays in potentially the hardest conference in the nation — four NCAA tournament teams in 2017. Still, four of the nine non-conference opponents won 11 or more games last season. Madura said the tough non-conference schedule keeps them sharp for the ACC. “We want the out of conference games to be tough so we can be ready for UNC, Syracuse and everyone else,” Madura said. One of the biggest jobs as seniors is to pass on the attitude of the program. Howell said there’s a blend between the new staff and returning players. “Teeter is putting in his new culture and we’re adding to what we’ve done in the past years to mesh with his style,” Howell said. Madura said closeness of the senior class has helped each other through the difficulties of their tenure. “We have such a close-knit senior class, so we’ve been able to talk things out and support each other,” Madura said. When a new coach comes into a program, players try to decipher the person in charge. Howell and Madura both described Teeter in one word: Unpredictable. Despite being unpredictable, Teeter made one message clear. Howell added players see Teeter’s love for the game and the team every day in practice. For Teeter, staying unpredictable is the goal. “It’s a part of my philosophy,” Teeter said. “When I first got into coaching, I used to add to problems when I was trying to fix it. Then I realized if I could stay ahead of my players then I don’t get drawn in the middle of the problems. “I tell my players, ‘Don’t try to figure me out, because if you do, then I’m finding a new career,'” Teeter said. Teeter keeps routines, but said breaking them keeps the players intrigued and on their toes. Expect Louisville to take more “educated risks” this season, aiming for quality over quantity on the offensive end. The Cardinals will keep the same pace under Teeter, but matching the same success is to be seen.